Owning a Jeep is a ton of fun (two tons, actually). The Jeep convertible is a true symbol of freedom and each one becomes its own unique piece of art. Depending on the Jeep you buy, it can come with some pretty amazing features. However, some Jeep mods are more beneficial and useful than others and you probably don’t want to be caught on the trail without them. 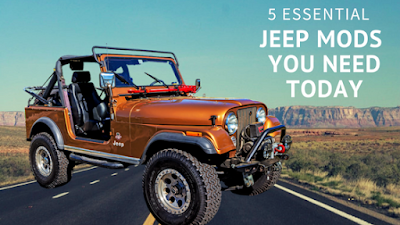 So, we’ve put together our favorite Jeep upgrades that no owner should live without. Driving a Jeep with the top down is an adventure in itself. However, it is important to remember that a good convertible soft top is necessary for keeping your Jeep’s interior protected from mold, mildew and bad weather. Jeep soft tops are easy to install and remove, made from durable materials, and built to survive rugged outdoor use. Trail tires are essential to owning a Jeep and one of the most important off-road Jeep mod you should consider. All-terrain tires are great for many situations, but if you will be climbing rocks and ultra-rugged terrain, you will want a tire with thicker tread able to withstand sharper edges and harder impacts. Trail tires may be louder on highways and surface streets while slightly lowering your gas mileage, but you’ll be able to find those hidden fishing and camping spots with ease. With bigger tires, comes the need to jack up your Jeep in order to give the tires enough room to fit and maintain maximum turn radius. The right lift kit will allow your Jeep to maintain its center of gravity while easily conquering the toughest rocks and off-road terrain. With a new lift kit, you’ll want to upgrade your suspension system as well. This will help alleviate the rough ride when on the trails and on surface streets. You’ll have improved visibility everywhere you go and the confidence to clear any obstacle in your way. A reliable winch and tow hook are necessary for easily pulling your Jeep or other vehicles to safety. Even the most experienced off-road enthusiasts can get stuck from time to time and a winch and tow hook can save your crew the trouble of digging out when you’d rather be fishing, hiking or relaxing at your favorite spot. A tow hook allows you to carry additional gear anywhere or pull trailers and other vehicles on surface streets. If you truly want to go off-road, you’re going to come across streams, rivers or deep mud that can potentially clog and kill your engine. Mounting a snorkel kit to the engine air intake allows you to traverse through deep water without disrupting airflow to the engine. They look awesome and a good one will work like a charm! Snorkels will slightly affect your Jeep’s MPG rating, so we recommend only installing one if you plan to make the most of it. One of the best aspects of Jeep ownership is the endless upgrades and mods you can incorporate to enhance the Jeep’s performance, comfort and style. These are just a few of our favorite Jeep mods we feel make Jeep ownership so unique and rewarding. How do your favorite Jeep upgrades enhance your off-road experiences? Share your stories in the comments! I can't believe I didn't think of any of these mods before. I would never buy a jeep with a snorkel kit. The electronics would be shot in a few months after the first trip submerged. No way! !